I am rather more-ish when it comes to cookies. You will probably not find me waxing rhapsodic about the simple charms of a basic, not-too-sweet butter cookie. I want a little more going on when it comes to cookies. More flavors, more textures, more zing. And more cookies please. These cookies are all that AND a bag of chips (no, not literally). They’re packed with rich chocolate flavor that’s enhanced by chocolate chips, plus they have the warmth of spices and the heat of chilies. They’re crunchy on the outside and chewy in the middle. And despite packing enough heat to make you open your eyes when you bite into them, they seem to be universally appealing, as we discovered when we left a plate on the dining room table. The enterprising and surprisingly agile Nuni climbed onto the table, helped herself to three cookies, and proceeded to smear chocolate all over my dining room chairs. Which is why we keep an oilcloth on the table and plan to reupholster those chairs. But I digress. You can make these in your stand mixer, or if you’re like me and your stand mixer doesn’t live on your kitchen counter and you’re too lazy to pull it off the shelf or even to find the hand mixer in your drawer, you can mix them in a bowl with a wooden spoon and they come out just fine. And I would recommend using excellent cocoa powder — dutch process if you have it (I get mine at Penzeys (which is conveniently near my office)). However, you can use regular chocolate chips and any old honey, since it really contributes texture more than flavor. They’re also fantastic to make with kids because the dough doesn’t have any raw egg, and can be eaten with impunity. I will have to warn you though — these cookies carry with them a dangerously high threat of eating the whole plate in one go. In a medium bowl combine the flour, spices, and cocoa powder. In a separate bowl, beat together the butter and brown sugar until the mixture is fluffy. Add honey and vanilla; beat until combined. In a small bowl, dissolve baking soda in 1½ teaspoons boiling water. Beat half of flour mixture into butter mixture. Beat in baking-soda mixture, then remaining half of flour mixture. Add chocolate chips and refrigerate for about 30 minutes. How spicy are these? Im not a spicy foods person so I definitely can’t live with spicy cookies. If I omit the chiles, would they still be good? How perfect for cinco de mayo! If you omit the chilis is there another spice that would be a good substitute? I’m printing out all the recipes for Memere. She thinks you are very clever and so do I.
I love chocolate combined with chile spices! These looks wonderful. Have you ever tried any of the Spicy Maya hot chocolate from Chuao? It is out of this world good in a mocha. I am loving the combo of chocolate and chili lately. Adding these to my list. Soop — you can grind the chipotle nad the cinnamon sticks in a coffee grinder (or a mortar and pestle if you have the patience). You can omit the vanilla altogether, but I’m not sure how to deal with the ginger — fresh ginger and ground ginger have very different flavors. If you want to try adding some grated fresh ginger, let me know how it turns out. 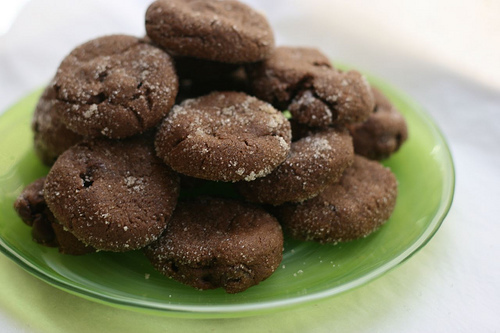 With cinnamon and chili these chocolate cookies sound really good! These cookies look, sound absolutely spectacular! These look great and they’ve got to be better than the ones I just took out of the oven. And no eggs, fantastic! Taking these to the Cookie Exchange Party! It was hard not to eat them myself! I’ve made these several times and I love them. I’m taking some to a cookie swap today and I know they’ll be popular. I didn’t have ground Chipotle, only dried. I ground them with my mortar and pestle and strained them with my tiny sieve. I also added a bit of Chipotle to the sugar that I rolled the dough in. I found 14 minutes to be long enough to bake them. Thank you for this recipe! I am excited to show these off at my Christmas party. I didn’t have the ground chipotle chili on hand, so I used cayenne and paprika. These cookies are fabulous. Next time I will make a special trip to get the chipotle, Mexican vanilla and some good cinnamon. And I will eat the whole batch myself. You have totally won my heart (and stomach!) with this recipe. I can’t wait to explore your website for more ideas! I just baked these cookies this afternoon and precisely followed your instructions, except I used ANCHO chili. These are amazing! I think I’ll be making these again and again. I’m using them to accompany my espresso-chocolate-chili Pots de Crème.